Have you been struggling with ingrown toenails? Are they a rare or a common occurrence for you? Regardless whether you have had it once or many times, it isn’t fun for sure. Here is a list of ingrown toenail treatments and prevention. Yay! No more pain on those beautiful toes. Sit down and take notes. Wear shoes that fit right. This means that your shoes aren’t tight, especially around the toes. Open-toed shoes are best, but in the winter, it is better to buy shoes that are half a size bigger ad wear nice thick socks inside so the foot doesn’t wiggle around. Always have an Ingrown Toenail Kit at home. 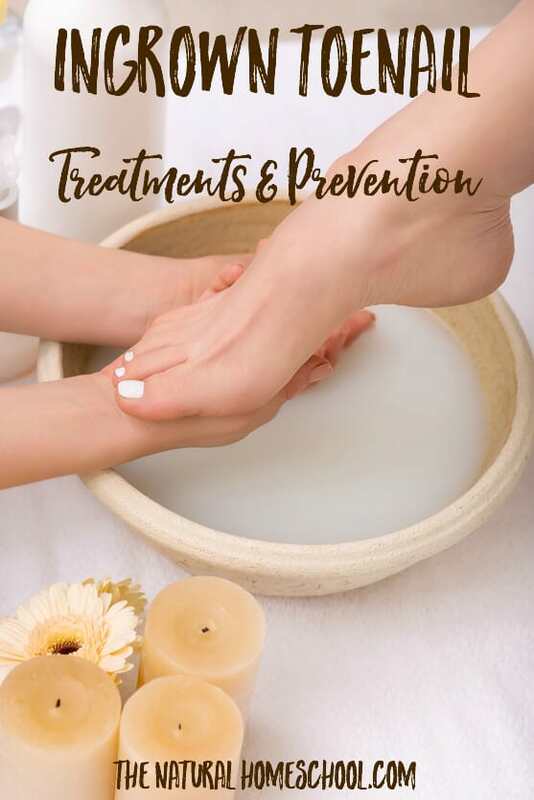 This will serve three purposes: to prevent ingrown toenails, to help heal ingrown toenails and to keep toes nice and pretty throughout the year. Here are some Essential Oils that have worked for us for Ingrown Toenails. These are absolutely amazing and have helped me so much. Take a look at this post. Every once in a while, treat yourself to an epsom salts soak. If you feel overly tired feet or feel like an ingrown toenail might be coming on, soak your feet in the hottest water you can stand and 1 cup of sea salt, pink Himalayan salt or epsom salts. Use a gel big toe cap for those uncomfortable times when your toes are bugging you and you need to wear close-toed shoes. For more details and great tips, read THIS book. Right now (March 2016), it is free for Kindle. Are the nails too stuck? Can’t get the ingrown toenail out all the way or is it too painful? Use a nail softener. It will help get it unstuck from the skin. Get pedicures regularly. I know, I know, nobody will see your feet during the winter, BUT remember that during the winter is when you might need to care for your feet the most. During the winter is when you wear close-toed shoes the most. Thank you for visiting our Ingrown Toenail Treatments & Prevention post!